The 2014 Atlantic Hurricane Season officially ends today. For a second year in a row, it was relatively quiet. According to NOAA, there were eight named storms this season. Of these, six developed into hurricanes and only two – Edouard and Gonzalo – were rated category-3 or higher on the Saffir-Simpson Scale. On average, the Atlantic produces twelve named storms and three major hurricanes (category-3 or higher) every year. Throughout the season, which runs from June 1st to November 30th, only one named storm made landfall in the U.S. Hurricane Arthur, a category-2 storm, brought powerful winds and storm surge flooding to North Carolina’s Outer Banks for Independence Day in early July. It was the earliest hurricane to strike N.C. in the state’s history. Other countries, such as Bermuda, were hard hit this hurricane season. In October, two storms – Tropical Storm Fay and Hurricane Gonzalo – slammed the island nation in less than a week. Experts say broad areas of high pressure and dry air were the main factors that hindered more extensive tropical development in the Atlantic this season. Temperatures across the country and around the world soared last month. In fact, October 2014 was the 4th warmest October on record for the contiguous United States and the warmest ever recorded for the entire planet. According to the latest global climate report released Thursday by NOAA’s National Climatic Data Center, Earth’s combined average temperature for the month – over both land and sea surfaces – was 58.43°F. That is 1.33°F above the 20th century average. October 2014 also marked the 38th consecutive October that our global temperature was above its long-term norm and the 5th month this year to break a global temperature record. 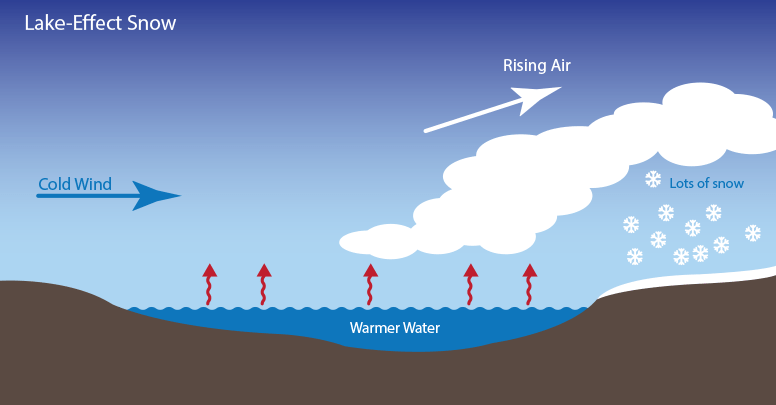 Rising ocean temperatures, according to NOAA, helped fuel this record warmth. The global sea surface temperature for October was 1.12°F above the 20th century average of 60.6°F. That is the highest on record for October and the sixth consecutive month to post a record high global sea surface temperature. Given all this warm water, it is interesting to note that El Niño conditions are not present in the Pacific. Year to date, the first ten months of 2014 were the warmest of any year on record. Global temperature records date back to 1880. The United States and China have teamed up to tackle the pressing global issue of climate change. President Barack Obama and President Xi Jinping announced their ambitious bi-lateral agreement in a joint press conference on Wednesday in Beijing, where both leaders were attending the Asia Pacific Economic Cooperation (APEC) summit. Under this historic agreement, the US will reduce its carbon emissions by 26% – 28% below its 2005 levels by 2025. China will cap its growing emissions by 2030, if not earlier, and increase its use of non-fossil fuels by 20% by the same year. While ambitious, climate scientists say the amount of emission cuts laid out in this bi-lateral agreement alone will not be enough to meet the current global goal of limiting warming to less than 2°C (3.6°F) above pre-industrial levels. That said, it does clear the path for other nations to take similar actions. The first indications of whether this bi-lateral action will spur long stalled global climate negotiations will come this December at the next round of UN climate talks in Lima, Peru. After that, the big test will be the 2015 UN Climate Change Conference in Paris, where the objective is a binding global agreement to reduce greenhouse gas emissions. Any deal reached there will go into effect in 2020. Science and photography have joined forces to increase public awareness about the pressing issues of climate change and the environment. 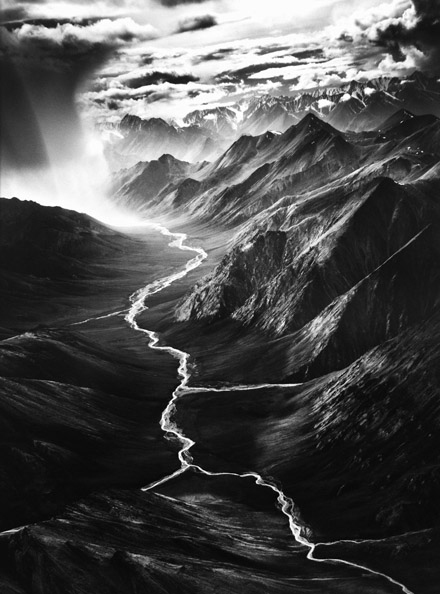 Sebastião Salgado’s Genesis, on view at the International Center of Photography in NYC, is a series of 200 black and white photographs that document what society has to lose if actions are not taken to mitigate climate change. They are the product of an eight-year global survey of landscapes, seascapes, wildlife, and indigenous peoples. Using the images as a springboard for discussion, the ICP has arranged a number of events to accompany the exhibition. These include a series of lectures and panel discussions as well as a schedule of gallery walks where climate scientists from Columbia University explain the environmental issues facing the particular regions represented in Salgado’s photographs. 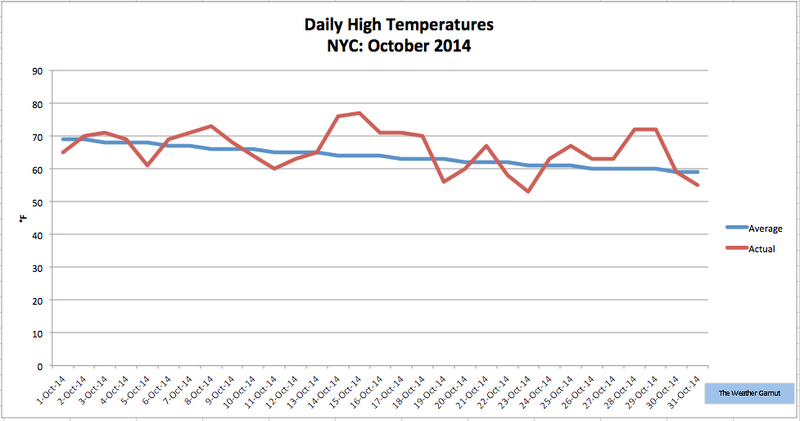 October was a bit of weather roller coaster in New York City this year. We had highs ranging from a chilly 53°F to a balmy 77°F. In the end though, with 19 out of 31 days posting warmer than average readings, the warmth won out. All together, the city’s mean temperature for the month was 59.6°F. That is 2.6°F above average. 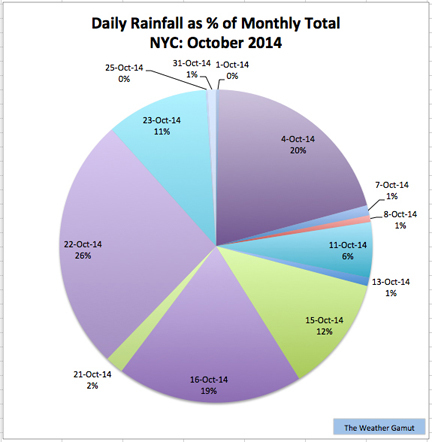 In terms of precipitation, the city was fairly soggy this October. Central Park measured 5.77 inches of rain, which is 1.37 inches above normal. Most of this came down during three significant rain events that each produced more than an inch of rain in a 24-hour period. Nonetheless, following a parched August and September, NYC and its surrounding area is still listed as “abnormally dry” on the latest report from US Drought Monitor.